Have a few, enough for a rip-roaring game of teeny, tiny musical chairs. From the fertile imagination of Charles Rennie McIntosh, the Scottish designer who was famous for his clean, whimsical designs for everything from earrings to the Glasgow School of Art (now sadly gone, burnt to the ground not once but twice). Fortunately, these chairs are all sterling silver and each distinctive and delightful in its own way. 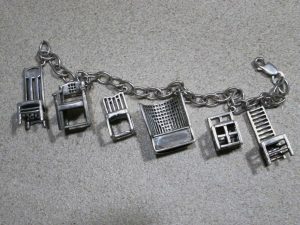 Click and view more images of the New York’s Museum of Modern Art gift charm here.